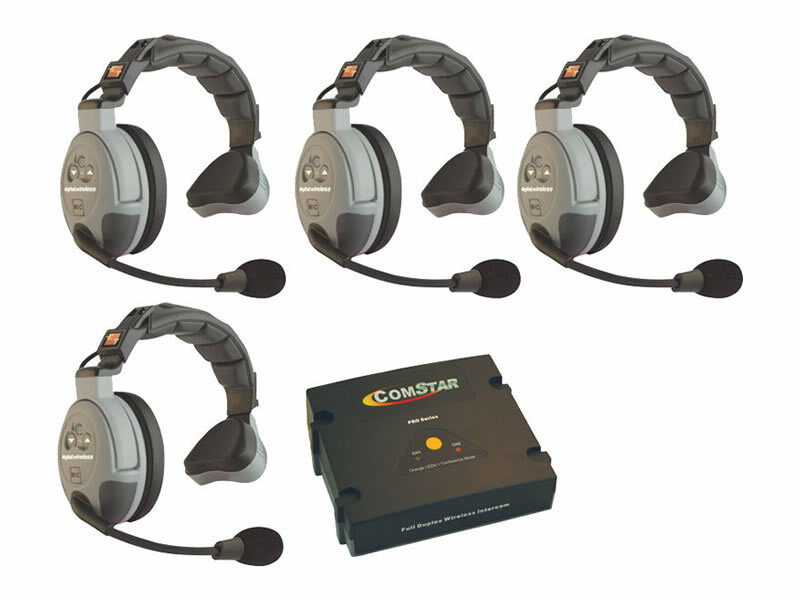 The Eartec ComSTAR Com-Center and Headset System is an ideal package solution establishing wireless, full-duplex communication for staff members, production applications, stage hands and more. The system consists of a single Com-Center wireless interface module with 4 8 headsets, and 4 ComPAK beltpacks. The system provides reliable wireless, full-duplex communication for up to 4 users at up to 400 yards. The headsets are form fitting for maximum comfort during long-term usage, and the ComPAK beltpacks feature volume control and battery compartment. Eartec COMSTAR XT 4 is 4-User Full Duplex Wireless Intercom System specifically designed for teams that need to communicate while working with their hands. The self-contained headsets (no belt packs) are not voice activated and there is no delay in transmission. Up to 8 users can speak simultaneously and communicate as they would on a traditional wired intercom system. One group of 4 users can communicate separately or all together in the conference mode. This intercom system features an operating range of up to 400 yards. The system is self-tuning without the need for a remote antenna. An AC adapter, a rechargeable battery (6 hour life), and an AA disposable battery sled are included. It operates in the 1900 MHz band, which is reserved by the FCC for “PCS” voice communication only. The system is certified for use in Europe.